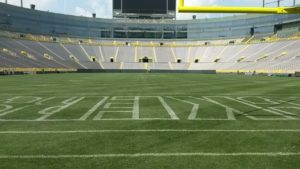 The 2019 NFL regular season schedule won’t be released until later this spring, but the Green Bay Packers at least know who their opponents will be and who they’ll face at home and on the road. The Packers will face opponents from the AFC West and the NFC East next season. And by finishing third in the NFC North, they will face third place finisher Carolina in the NFC South and third place San Francisco in the NFC West. Besides games against divisional opponents Chicago, Minnesota and Detroit, the Packers will host Philadelphia, Washington, Denver, Oakland and Carolina. The Packers will play road games against the New York Giants, Kansas City, the L.A. Chargers, San Francisco and Dallas.